REAL WORLD SALES TOOLS ​TO BUILD A MORE PRODUCTIVE SALES TEAM. Selling is more than taking orders. It's building relationships one client at a time. It's also mentoring and coaching a sales team that is maximizing every opportunity. Our sales tools help individuals and entire teams sell more by making sure nothing slips through the cracks. With Daily Gameplan, salespeople become more focused, organized, and successful. For sales managers and store owners, it means building a stronger and more productive sales team. ​ Our primary clients are in the auto (and related) and home furnishings industries, but we also work with others that operate, primarily, within a retail showroom setting. Whether you're an individual sales professional or run an entire sales team, our daily business planners & CRM platform give you the tools you need to sell more consistently and profitably. We're the only sales tool company that will send you product without credit card information. We can bill direct to your store, or work with you on specialized billing, as long as you're an authorized purchaser. We gladly accept credit cards as well. FOR OVER 2O YEARS, WE'VE BEEN HELPING SALES TEAMS SELL MORE. 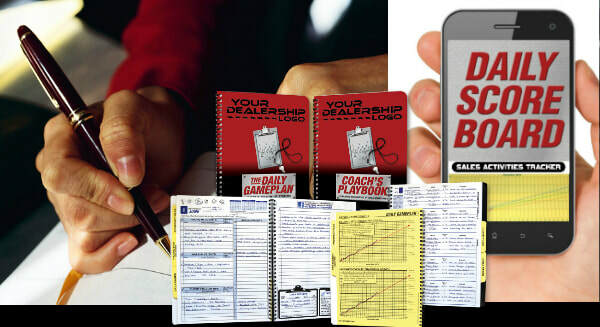 Daily Gameplan sales tools are purpose built for the way you sell and organize your day. All of our products work great with individual sales professionals, but designed as a sales team concept. SELL CARS, RV's, POWERSPORTS, OTR TRUCKS, BOATS, OR OTHER RELATED PRODUCTS? SELL HOME FURNISHINGS, CARPET, REMODELING, ETC.? All Daily Gameplan planners come with our exclusive 90 day money back guarantee. See results, or they're free. And you can still keep your planners. We're that sure of your success. "I average +10 additional units per month when I use the daily game plan. There are tons of online tools however something about actually writing things down just works. I've been using the daily game plan now for 8 years. I didn't use it for a few months (just to see if there was a difference with my sales) and there was a huge difference!"